OK, I admit it, sometimes I’m touchy about people’s choice of words. In a blog post, William Thomas, founder of the “green house” movement that places elders in smaller group homes instead of traditional nursing homes, said, “Because of changing demographics, it’s necessary to rethink how elders are cared for.” (Diel, Stan. Elder care expert Dr. William Thomas: New approach needed for seniors. The Birmingham News, Sept. 7, 2011. http://blog.al.com/businessnews/2011/09/elder_care_expert_dr_william_t.html). I’m going to talk about all of the above statement but it’s the latter part that I find trying, the “how elders are cared for.” We care for people and animals that cannot care for themselves and for some of us that state does come in old age, but in general I find a loss of sensitivity to the fact that older people, who might look like they need caring for, actually are still sentient beings capable of having a lot of say in their own lives. We must always remain mindful of that fact. The Green House Project, founded by Thomas, “is a de-institutionalization effort designed to restore individuals to a home in the community by combining small homes with the full range of personal care and clinical services expected in high-quality nursing homes.” (Green House Project web site – http://thegreenhouseproject.org). This organization works helps other organizations to build and operate these communal homes for elders. An example of one such partner is St. Martin’s in the Pines who have a new facility called Cottages at St. Martin’s (http://www.stmartins.ws/communities-and-services/the-cottages). So, this gave me an idea. 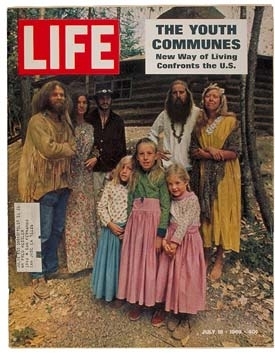 Harking back to the 60’s and the hippy commune movement (Where’s my old copy of the Whole Earth Catalog? ), why not encourage people as they grow older to form into cooperatives and build communes? Everyone could buy into the coop and there would be private living quarters plus common areas for social gatherings and recreation. The coop could even develop business activities. Who says old people just have to play Parcheesi and watch TV. The coop would have some form of on-site staff for daily needs and access to other health care professionals who would come to site as needed. This would require some planning, but today’s emerging elders are the Baby Boomer generation and they have smarts and capital, so such a coop to provide for one’s later years would be easy to put together. So, as we age towards the Age of Aquarius, let’s gather up our love beads and a copy of the Whole Earth Catalog and head out into the hills to build a commune for the last days of our lives.